Your skull? My skull? Anybody’s skull? We’ve all got skulls inside our heads. I’m getting ready to teach a class on drawing faces, and the foundation of the face is understanding the skull. Skulls are beautiful and amazing, and much of how our faces appear is produced by their hard shapes, under our skin. 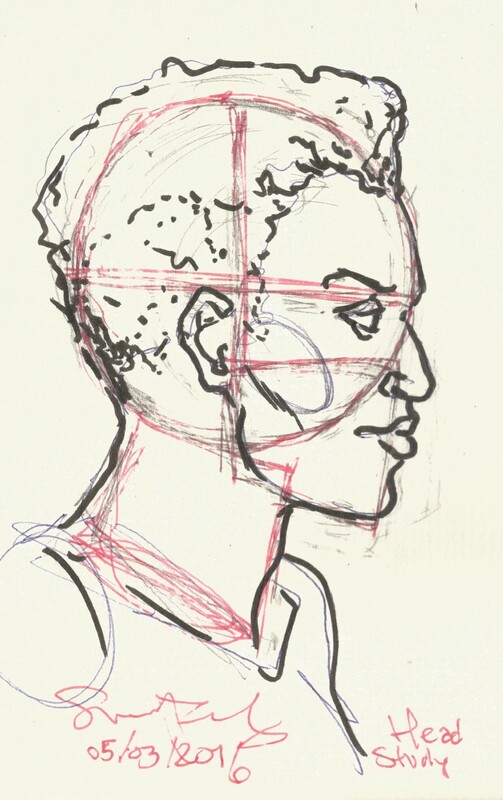 So when I draw people, I start with a construction that represents the hard stuff- the lovely round top and the boxy jaw. 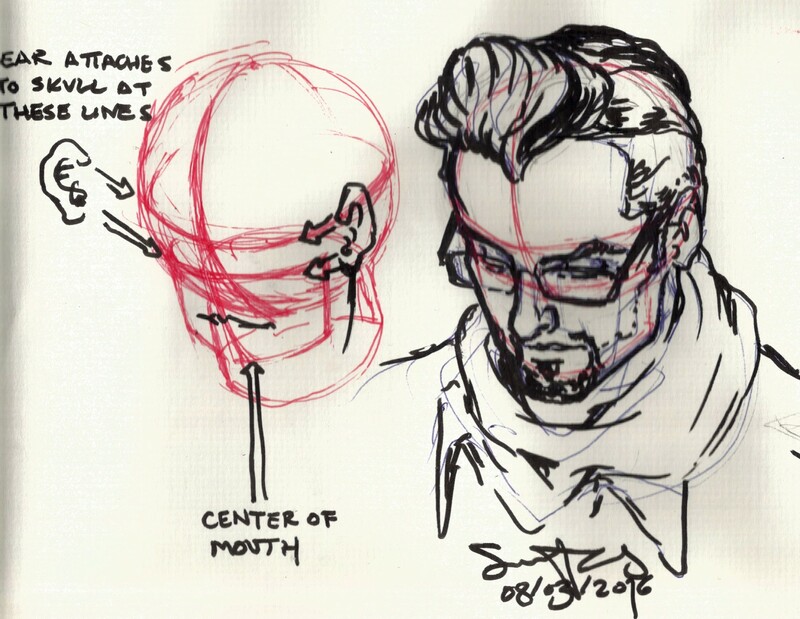 I come from a traditional school of illustration where a system for drawing the figure is always based on a construct, a manikin you build inside your own head. The great drawing teachers of the 20th century, such as Andrew Loomis and Burne Hogarth, each had their own system for creating the manikin. 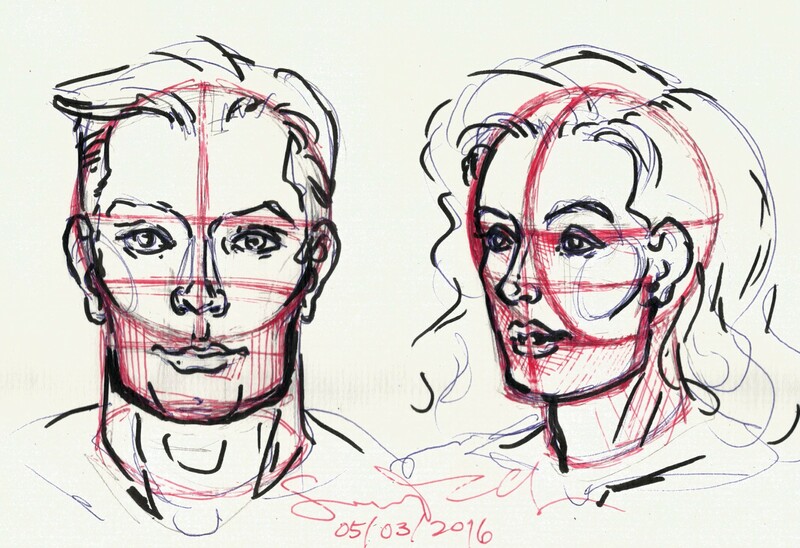 And many basic drawing classes start with the idea of representing the head as the simplest possible form, as a circle or oval. I’d like to share my personal system for drawing the head, which is based on neither a circle nor an oval. I treat the head as a ball or sphere with a little shape attached- a shape like the box strawberries come in, or the basket you ride in below a hot-air balloon. The ball has a line drawn around its latitude and longitude. The jaw shape or plate claps onto the front of the ball, like the hinged faceplate of a suit of armor. It attaches halfway down from the latitude line. The longitude line continues down the front of the jaw plate as well. 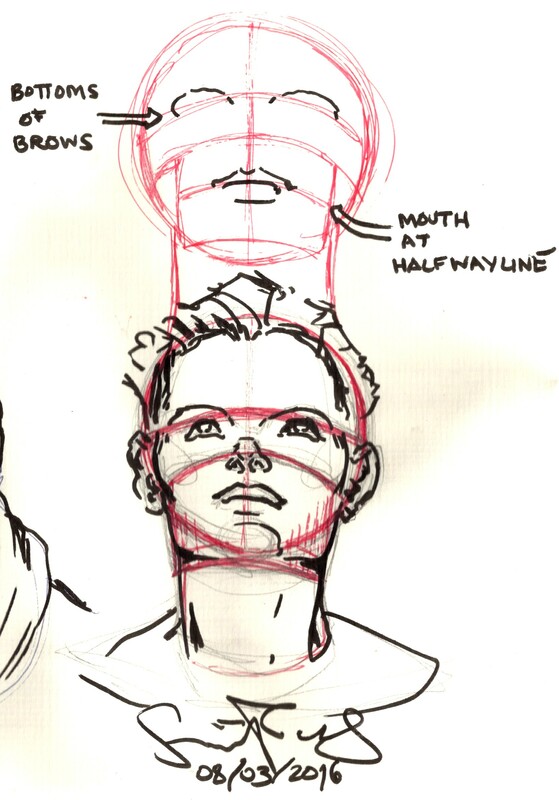 Becoming comfortable with visualizing and rotating a simple construct like this can give an artist much greater confidence in drawing the head. My system also creates placement for the ears, attaching to the head at the latitude line and the top of the jaw plate. I know if I’ve drawn the latitude line curving around the ball carefully and I place the top of the ear along it, the placement of the ear will be believable. The jaw plate creates a surface for the mouth, which is set at the middle of the plate. Its curved surface follows the curve of the sphere, which is very helpful when projecting placement of the mouth in upshots and downshots. Having a base model as a starting point is also helpful in portraiture. I use it to measure the distinctive features of an individual as well, by the amount they might vary from the base. I believe you should take what you like and leave the rest, so if my base model doesn’t feel natural to you, why not try Loomis or Hogarth? 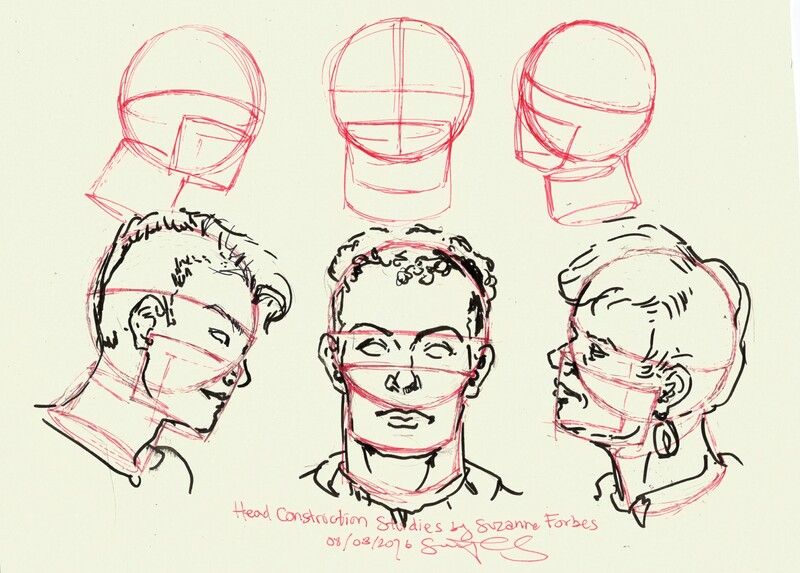 This entry was posted in Art Tutorials, My art and tagged comic drawing tips, drawing tutorial, head drawing tips, head drawing tutorial, portrait drawing tips, Suzanne Forbes artist on March 11, 2016 by Suzanne Forbes.